Multimode fiber optic patch cables come in 62.5 micron and 50 micron diameters for the actual glass core. With the cladding layer, they are both 125 micron, and with the buffer layer they are 250 micron. To prevent excessive loss (attenuation), you should ensure that you purchase patch cables that match the core of any other fibers to which you are connecting. 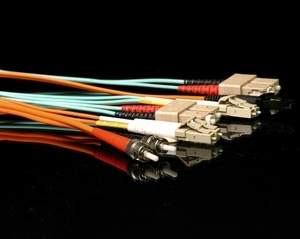 The PVC jacket of the multimode fiber is normally orange (OM1 or OM2), Aqua (OM3) or Violet (OM4) (although we can make them in other colors) and is 3.0mm in diameter for ST, SC, and FC connectors, but 2.0mm if the cable has an LC or MTRJ connector. We can also make these cables with a plenum jacket or a LSZH jacket, if required. Multimode cables have a larger diameter glass core than singlemode cables and are typically used for shorter distances and/or lower speeds and operate from less expensive light sources. The light sent through multimode cables may be driven by a LED or a laser operating at 850 or 1300nm wavelength. The equipment at each end is what determines the speed and wavelength. The characteristics of the fiber are what determine the maximum distance. 62.5/125 fiber (called OM1) can carry a 850nm signal 300 meters, and a 1300nm signal 550 meters to 2 km. 50/125 fiber (OM2, OM3, or OM4) can carry a 850nm signal from 300 meters to 1km and a 1300nm signal 550 meters to 2km, depending upon the speed and fiber grade. A singlemode fiber can often carry a signal 100km or more. The term “multimode” refers to the fact that the light takes multiple paths (modes) through the glass fiber core, as opposed to “singlemode” where the light takes a single path. Because the light travels different paths, the longer the cable is, the more distortion is caused by the different paths arriving at the receiving end at slightly different times. This is why singlemode cable works better for longer distances.